The future of Leeds United is again in doubt after the club was put up for sale by its administrator. KPMG said that it had made the decision because of a challenge by HM Revenue and Customs (HMRC) over the £7.7m it is owed by the Yorkshire club. 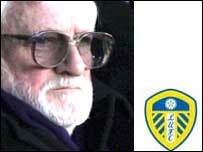 Former chairman Ken Bates had proposed to take Leeds out of administration, repaying creditors eight pence in every pound that it owed. A deadline for offers has been set of 1700 BST on Monday. "We are interested in talking to other parties," confirmed a KPMG spokesman. The administrator had earlier warned that there was now a danger the club would be unable to start the new season. Leeds United has debts of £35m, including the money owed to HMRC in unpaid taxes. Those who have previously declared an interest in buying the club include Duncan Revie, son of former Leeds manager Don, and property entrepreneur Simon Morris. Earlier this week, businessman Simon Franks said he was ready to buy Leeds United, through his Redbus investment vehicle. HMRC has been challenging Mr Bates's plans to exit administration at a High Court hearing in Leeds. KPMG said that unless the club was able to leave administration, the Football League may not let it start the season. League officials are due to meet next week to discuss the situation. The court case has been adjourned until 3 September, while Leeds are due to play their first game of next season away to Tranmere on Saturday, 11 August. Former Leeds chairman Gerald Krasner expects the ownership question to be sorted out before the start of the season. However, a spokesman said that as the club was in administration he could not comment on KPMG's decision. And Mr Bates has already warned that the cost of defending the HMRC's court action could cost the club its future.